Visionary music educator José Antonio Abreu will be awarded the Notre Dame Prize for Distinguished Public Service in Latin America at a ceremony in Caracas, Venezuela later this year. The award ceremony will be held in conjunction with a concert by the National System of Youth and Children’s Orchestras and Choirs of Venezuela, commonly known as “El Sistema,” in the Center for Social Action Through Music. Administered by the University of Notre Dame’s Kellogg Institute for International Studies, the Notre Dame Prize is the only award of its kind that recognizes leaders who enhance their region’s welfare. The award celebrates the significant role public figures play in improving the well-being of Latin American citizens. Trained as an economist and a conductor, Abreu founded El Sistema, a Venezuela-wide network of orchestras and educational centers, as a means of fighting poverty and violence and developing successful young people through classical music. “Music is an agent of social development in the highest sense, because it transmits the highest values—solidarity, harmony, mutual compassion. It has the ability to unite an entire community,” Abreu has said on several occasions. The countless children who attend El Sistema’s music centers in Venezuela receive free instruments and lessons, and no child is turned away. Some of Abreu’s students have become international stars, and El Sistema’s success has been replicated in more than 25 countries around the world, including the U.S.
“Abreu believes that the discipline of orchestral practice can transform the lives of children at risk by creating a new family and a new sense of identity for them,” says Carmen-Helena Téllez, Venezuelan-American conductor and Notre Dame professor of music. “The way Abreu has applied this notion to deliberately overcome the terrible economic and social hardships endured by children in Venezuela has been extraordinary. Now that some of the alums of Abreu’s project have become world-class musicians, his method is being imitated everywhere, to the point that many revere him for giving new life to classical music and bringing it to all layers of society here and in Europe,” says Téllez. First awarded in 2000, the Notre Dame Prize is funded by a grant from The Coca-Cola Foundation. “The Notre Dame Award for Distinguished Public Service in Latin America is recognized as the most prestigious prize in its category,” says Rodrigo Calderon, president of the Coca-Cola Foundation México. The award carries a $15,000 cash prize, with a matching amount donated to a charitable organization recommended by the laureate. 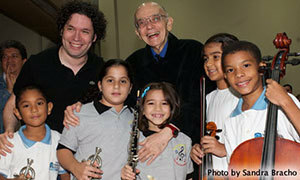 Upon the recommendation of Maestro Abreu, the matching prize will be donated to El Sistema. Past award winners include former Brazilian President Luiz Inácio Lula da Silva and Haitian Archbishop Louis Kébreau. Originally published by Susan Guibert at newsinfo.nd.edu on January 15, 2013.